At this time of year up and down the country Christmas Markets are springing up everywhere. 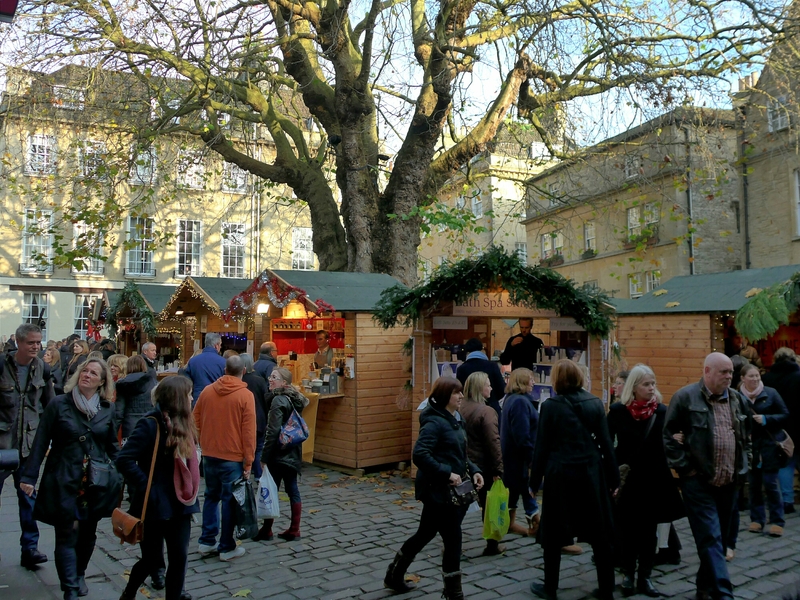 Acknowledged as one of the very best, Bath Christmas Market opened this week and will run for three weeks. For the market lots of wooden sheds – sorry chalets are set up and used as ‘pop up’ shops by both local businesses and others from further away. Today’s picture shows some of them in Abbey Green. Not everyone celebrates this event, some local parking is suspended for example. The biggest problem is its success, too many people come to Bath; car parks in town and at the Park and Rides fill up early then there are masses of extra buses and trains. Last night the bus services just froze, today we went in early and escaped before it became too crowded; local social media has been full of complaints and reports of problems with crowds and at the railway station. Happy Christmas! It’s a shame about the crowds and the public transport but, as you say, a result of its own success! Doesn’t snow here often but they’re talking up the chances for this Christmas. *wo’nt happen!